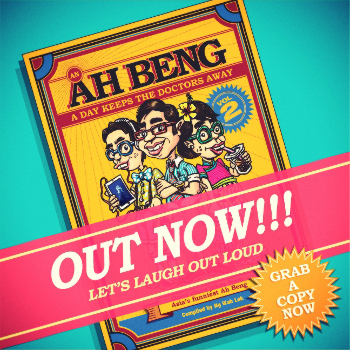 AhBeng.org - Welcome to www.AhBeng.org, Ah Beng's Hilarious Website ! This website is a compilation of good and clean Ah Beng jokes. Ah Beng is Asia’s funniest comedian, ie. Asia’s equivalent of Mr. Bean. I hope reading this website will bring you some laughter today. 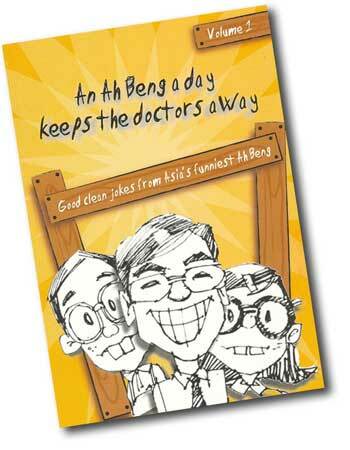 The content in this website are taken my joke book entitled , “An Ah Beng a day keeps the doctors away”. Prov 17:22 “A merry heart does good like medicine but the broken spirit dries the bones”. Have a good laugh. Be healthy and happy ! An Ah Beng a day keeps the doctors away ! Latest Ah Beng Jokes ! Why is lightning faster than thunder ? Ah Beng and Ah Lian were on the beach on a stormy night. There were lightning and thunder all over the place. Ah Lian asked Ah Beng, “Why is it we always see the lightning before we hear the thunder ? Aoccdrnig to Ah Beng's theroy on Enlgish, it deosn't mttaer in waht oredr the ltteers in a wrod are, the olny iprmoetnt tihng is taht frist and lsat ltteer is at the rghit pclae. The rset can be a toatl mses and you can sitll raed it wouthit porbelm. Tihs is bcuseae we do not raed ervey lteter by it slef but the wrod as a wlohe. I think all of us can understand what Ah Beng wrote above. So he must be right. So Ah Beng can be quite clever after all. To impress Ah Lian, Ah Beng took her to a very expensive Italian restaurant. After sipping some fine wine, he picked up the menu but could not understand anything as it was all in Italian. Still wanting to impress Ah Lian, he went down the list in the menu and decided to pick the last item. Ah Beng confidently told the waiter "We'll have the last item, Giuseppe Spomdalucci,". The waiter replied, "I am sorry, Sir, that’s the name of the owner."